Protests in Rome turned violent, while in Dublin there were peaceful marches in the city centre. PROTESTS ARE CONTINUING in some cities around the world following yesterday’s global day of action inspired by the Occupy Wall Street Protests and demonstrations in Spain. Protesters in Chicago have been arrested after they formed human chains around Grant Park. The Chicago Tribune reports that demonstrators were given an ultimatum by police: they could either leave or face arrest. Many stayed put and didn’t resist arrest. In New York last night thousands of demonstrators mixed with onlookers, Broadway showgoers, tourists and police to create a chaotic scene in the midst of Manhattan. “Banks got bailed out, we got sold out!” protesters chanted from within police barricades. Police, some in riot gear and mounted on horses, tried to push them out of the square and onto the footpaths in an attempt to funnel the crowds away. 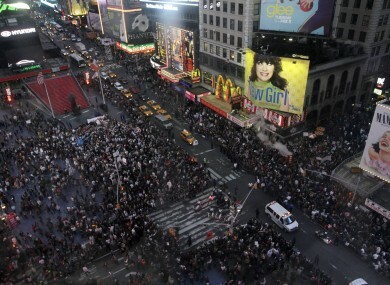 The Times Square rally lasted several hours before the crowd dispersed. Over the course of what was billed as “a global day of protest,” city police arrested more than 80 people in demonstrations at Times Square, Washington Square Park and a nearby Citibank bank branch. Police cited violations such as wearing masks, criminal trespass, and refusing to leave the park at midnight when police warned them it was closed. Police spokesman Paul Browne said one of the police officers hospitalized suffered a head injury, the other a foot injury. Two dozen were arrested when demonstrators entered the Citibank bank branch and refused to leave, police said. Citibank said in a statement that police asked the branch to close until the protesters could be taken away. “One person asked to close an account and was accommodated”, Citibank said. In Rome riot police fired tear gas and water cannons as violent protesters hijacked a peaceful demonstration against corporate greed, smashing bank windows, torching cars and hurling bottles. Elsewhere, hundreds of thousands nicknamed “the indignant” marched without incident in cities across Europe, as the “Occupy Wall Street” protests linked up with long-running demonstrations against European governments’ austerity measures. Heavy smoke billowed in downtown Rome as a small group broke away and wreaked havoc in streets close to the Colosseum and elsewhere in the city. Clad in black with their faces covered, protesters threw rocks, bottles and incendiary devices at banks and Rome police in riot gear. With clubs and hammers, they destroyed bank ATMs, set trash bins on fire and assaulted at least two news crews from Sky Italia. Premier Silvio Berlusconi called the violence a “worrying signal,” and added that the perpetrators “must be found and punished”. In Dublin more than a thousand people took part in demonstrations, with marches from the Garden of Remembrance bringing some of the city’s streets to a standstill for a time yesterday afternoon. Email “Arrests in Chicago, New York and Rome following global day of action”. Feedback on “Arrests in Chicago, New York and Rome following global day of action”.